Disclosure: As a part of the DecoArt Blogger Outreach program I received the paint used in this post for free. All opinions, thoughts and ideas are my own. 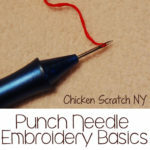 Do you ever plan a project and then, when you get to the first step you realize it’s never going to work? When I received my box of paint for DecoArt I pulled out my stash or random mason jars and got ready to work. Then I realized it would never work. My plan involved painting on the outside of the jars. All of my jars have embossing on all sides of the jars, so it wasn’t going to work. Back to my stash of random jars (we buy a lot of bulk items from the Mennonite Store and transfer them to old glass jars so we have a whole cabinet full and I eat a jar of pickles every 2 days) and I pulled out a stash pickle jars, including the mega jar. After washing the jars really well in hot, soapy water and letting them dry I pulled out the paint. I squirted my paint into a small plastic cup and mixed it up with my paintbrush, then I started painting the whole jar. I did one where I painted the inside, decided it was too hard and tried painting the outside. It went much faster and it didn’t look much different (they do feel different though) so I continued on with that method. I did a few coats, letting the paint dry between each coat, if you don’t it starts to peel and gets clumpy (not that I would know). I did some jars in straight orange, some in yellow-orange mix and some in red-orange mix. To be honest I can’t really tell the difference between the yellow-orange and plain orange, maybe if I had used more yellow and less orange it would have helped. I prefered the chip brush because it left a streaky finish and it reminded me of the lines on pumpkins. After the orange paint is completely dry whip out the Glass Writer and get ready for some fun. I free-handed the faces on the small jars. They happen to be exact replicas of my fence post pumpkin faces so apparently I’m a one (two?) trick pony when it comes to pumpkin faces. 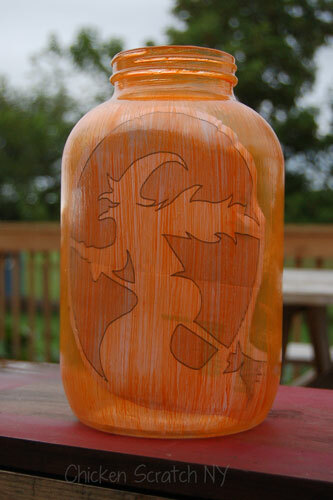 I wanted to do something special with the large jar (yes, it’s a pickle jar and yes, I ate the pickles) so after it was painted I printed out a witch jack-o-lantern stencil and taped it inside the jar. It didn’t fit perfectly but it was easy enough to fudge a little. You know what that means? You don’t need any artistic ability to do this! It’s basically tracing with the glass writer! *Bonus tip – hold the jar up to the light to see if you missed any little spots with the opaque paint, it’s really thick and sometimes the bottle tip leaves little divots behind. After the jars were painted and had sat for a few days I baked them according to the directions on the bottle. I removed them from the oven when they were completely cool and filled them with candy (can I say that Halloween candy is stupidly expensive! ), covered the jar mouth with a few layers of tulle netting, secured it with a rubber band and added some ribbon to cover it up. Voila! Easy enough right? 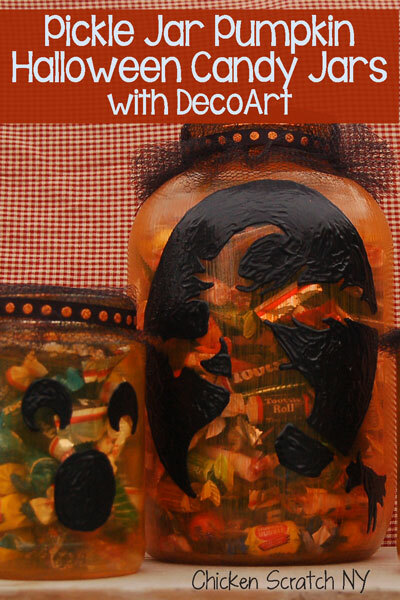 You too can make your very own Pumpkin Candy jars with DecoArt glass paint! This post is part of the Sharing is Caring Halloween Blog Hop hosted by Life With Lovebugs, Pam’s Party & Practical Tips, and A Spectacled Owl! All of the blogs listed below are sharing Halloween themed posts as part of this event, so click on one or all of the links below to find some great recipes, tutorials, crafts and more! This is is very cute idea that I really love! Simple; yet pretty! These are so cute! I love seeing all these adorable halloween crafts! This is a cute idea. I may have to try it. Adorable! I really love how these came out 🙂 My 14 year old son loves pickles too and I never thought to reuse the jars, but I do keep jars from spaghetti sauce & things like that. Great job! This is an adorable idea! I think we might try making these soon! Such a fun idea…love this! Love this! I always have a stash of glass jars around the basement and think I have one that this would work for. I must say, you eat a lot of pickles! I will have to go out and look for this paint, I don’t think I have ever seen it before. We have 4 people who eat pickles in our house and love them.. so we are lucky if a huge jar last more than a day in our house.. So we also have a large collection of Glass Pickle Jars.. 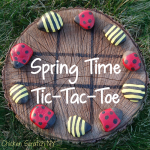 I know my 6 year old would love to do this project.. something fun she can.. do.. Thank You for sharing… cute idea. They came out just perfectly. Love, love the idea! Oh how cute is that? I just love the idea.. and the up-cycling! Good stuff! I love Halloween crafts! That’s a great idea. Using mason jars for projects can be lots of fun. I love how you improvised and it ended up looking awesome! What a very cute idea 🙂 I could see this being a fun project with younger kids! 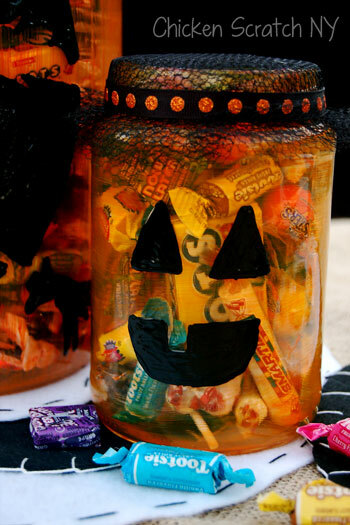 I’m one of the participants in the Sharing is Caring Halloween Blog Hop and I’m pinning your entry. I have never painted a Mason Jar before. I love the designs you picked. The orange and black are perfect! 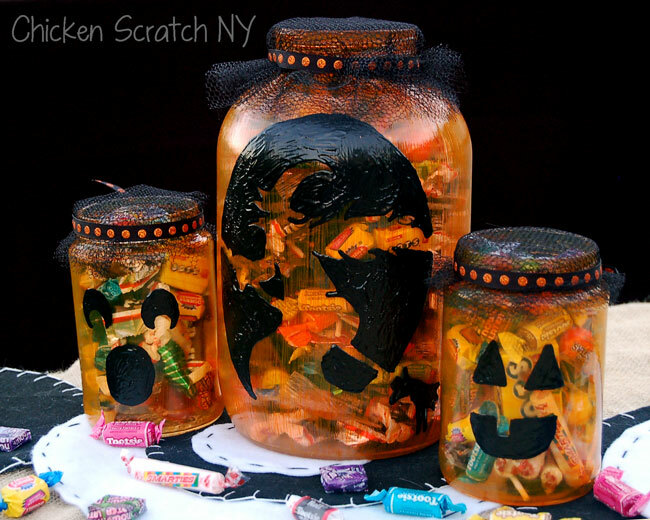 I wouldn’t turn down a fun jar like this, in fact the candy would probably disappear and only the jar would be left as a decoration 🙂 No one would know anything’s missing right?